Duyyam Abhiyanta posts in this BMC recruitment 2018. Candidates who are having engineering degree in Civil or Electrical or Electronics or Mechanical or Architecture disciplines they can apply for this BMC Sub Engineer posts. Interested candidates can submit their application form online through BMC official website of www.portal.mcgm.gov.in. Last date to apply online for this BMC SE jobs is 31-12-2018. 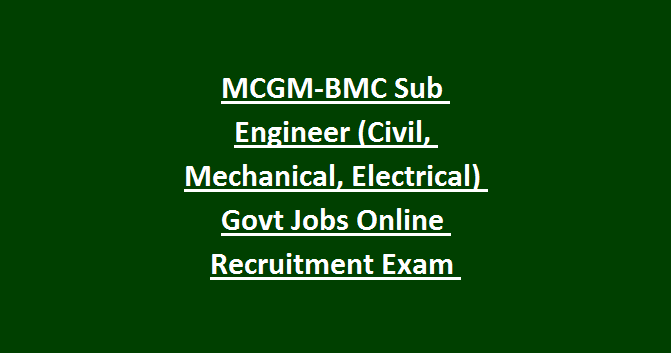 Candidates selection for this BMC Sub Engineer Civil/Electrical/Mechanical jobs will be based on online examination only. 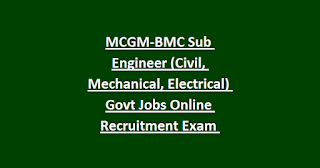 Exam Pattern and Syllabus, sub engineer selection process, SE Civil online application form and other details are updated below for this MCGM Brihanmumbai Mahanagarpalika recruitment exam 2018. There are 291 Sub Engineer vacancies in this Brihanmumbai Mahanagar Palika recruitment 2018. Age limits are 18-38 years for open candidates. 18-43 years for reserved candidates. B.E or B.Tech or its equivalent qualification engineering degree in Civil Engineering or Electrical or Mechanical or Architectural Engineering. For General candidates application/exam fee is Rs.600/- and for others Rs.300/-. Written exam will be conducted for this Brihanmumbai Mahanagarpalika recruitment of SE Civil/Electrical/Mechanical vacancies. Written examination will be conducted for 100 marks for this BMC Sub Engineer jobs. Candidates who are qualified engineering degree in respective discipline they are only eligible for applying this BMC Sub Engineer Civil/Electrical/Mechanical vacancies. Online application form submission last date for this BMC SE jobs is 31-12-2018. NON TENCHICAL SYYLABUS DIDNOT UNDERSTAND ? Non Technical Intelligence Test Means- High Level reasoning and arithmetic to test candidates intelligence skills. Administrative skills: In this section they may ask questions to test candidates communication skills. Can diploma holders apply for BMC?